A Petrol Tank Cleaning Method : Using a 1600 lb. engine driven high pressure washer, and a home made 30 gal. auxiliary source tank, the job is made easy. Fill the tank with water made into a solution with common baby powder or pumice, whichever you have on hand. Modify the pressure washer wand end, bending it into a 90o angle, and cover the tank with a protective wrap to prevent any mishaps with the paint. With the gas cap and petcocks removed, insert the 90o wand into the gas cap cavity. Engine running, pressure up, sporadically trigger the wand in all directions for no more than three or four minutes. This is usually enough to remove all rust to a shiny metal surface. Flush a couple of times with water. Let the tank dry. You can assist drying by using a shop vac on "blow" in the gas cap hole. After the tank is thoroughly dry use your shop air compressor at 125 lbs. pressure. Blow in the gas cap and petcock holes. When you see no more "white cloud" exiting the tank, the job is finished. You can then use the quality tank liner sealant of your choice to protect any further rusting to infinity. The trick with tank liner sealants is in the preparation. It only takes about an hour to properly remove rust and seal tank. Of course you follow the directions, and there is a cure time on all liner sealers. It's a good idea to double that time before the tank is put into use. Most, if not all restorations, involve the seat. The best restorations are accomplished by rebuilding an original. Often when rebuilding an original seat the only items that will be retained are the rolled edge metal tool tray slide, the A frame containing the front seat tab mount, the two rear support tabs, the delta concave rear fender clearance shield, the two flat bar stiffener straps, and the horizontal loop tubing support. In every case when restoring one of these old bikes, the ply board base, the foam and the cover, will have to be replaced if you're looking for a quality end product. Sixty year old foam hardens and loses it's elasticity, the ply board laminations are usually separated and weak, and in the case of the Naugahide cover, where the backing was cotton cloth, the cotton has lost it's youthful vigor. The cover, the ply board, and the foam are all readily available. If the ply board on your old seat hasn't deteriorate too badly, you can easily use it for a template to cut a new one. I make sure when I buy it, that I am buying waterproof marine ply board, instead of the commonplace interior/exterior that's bought at the local hardware store. If you cut your own ply board base, make sure you sand the edges. It's a good idea to sand a 1/8" radius on the lower edge of the ply board base, as it will greatly improve the longevity of the Naugahide cover. For durability of metal parts, they can either be stripped, primered and painted, or powder coated. On the seats that the Vincent company had made, the metal was all painted black as well as the ply board. The covers were attached to the ply board bottom both by staples and by upholstery flat brads. I prefer the brads. To me it adds a touch of class. In regard to the cover itself, you'll probably be happier if you have a reputable upholsterer who specializes in antique motorcycle seats, do the job, rather than using a seat cover manufactured in India. And selection of the Naugahide is paramount in achieving a "Class Act" seat when finished. It's time to talk about the woes of some of the after market seats. Here are some of the things I've found to be unacceptable: The front ears too short, not allowing clearance between the seat and the rear of the tank. Bottom A frame rear seat tabs either too close together or too far apart, causing binding of the friction shock uprights. Seat base made from particle board. Poorly fitting fiberglass, delta shaped, concave, clearance shield. Poor glue adhesive. Naugahide covering not even close to original. Naugahide stitching not to original specs. If you don't have a seat with your restoration, you have to work with what you do have. If your bike by some misfortune has one of the aforementioned after market seats, I'd approach it like this: Ensure that the A frame bottom bracket is correct. Measure the center distance of the four tabs on the bike's rear frame member. Ensure that the distance is the same on the bottom A frame attaching support of the seat at the rear. This cannot be over emphasized, as it is very important for proper operation of the friction operated rear seat upright supports. All friction is directed at the friction lining, and nowhere else, i.e. seat mounting bushings. If you're satisfied that the seat mounting points are correct in regard to the mounting points on the bike and the rear swing arm, when friction knobs are backed off, the shock and spring boxes are removed, and that a free, effortless, up and down movement of the swing arm is achieved, (for this check I hang the bike with tie down straps located at the forks and at the rear of the fuel tank with my handy dandy homemade A frame), you can reinstall rear swing arm spring boxes and set the bike back on the ground. On almost all motorcycles, the crown of the restoration is the gas tank. This is what you see first when you walk up to a bike, as the gas tank is the primary identification of the marque. Any blem, or something that just doesn't look right, i.e., striping, logo badges, gas cap, and in the case of the Vincent, of course, the Mercury Crest. Before you bring the gas tank to a concourse state cosmetically, it's a good idea to do some preliminaries. First determine if the tank you have is the tank you want. Often basket cases are a hodgepodge of this and that Vincent parts. There were four tanks made for Vincents, and possibly one other for prototype Indian Vincents. The outside configurations were all the same, but the bottom cavities provided for carburetor clearance and frame clearance were quite different. Rapides normally had a smaller cavity in both the B's and C's., than the Shadows in the B's and C's. The D tank won't fit on the B's and C's due to only requiring a narrow alleyway to clear the strong back tube of the D frame. The D had about a gallon extra fuel capacity due to it's tank belly pan configuration. The factory Lightnings were all custom clearanced as to carburetors. The soundness of the tank is most important. Does it leak? Does it contain rust? How much body putty is on the tank, if any? Will it require a tank liner application? Are all of the tabs correct in separation width? Does the tank still retain the tire pump bracketry? Prior to checking for leaks on a tank that's been setting for a long period of time, it's a good idea to wash the tank innards with muriatic acid. The muriatic acid will attack those tiny stubborn rust particles that may be plugging up a pin hole in the gas tank that's not detected until a week later when you're 100 miles away from home on your first ride after restoration. Make sure when you use muriatic acid that you use gloves and eye protective gear. You MUST neutralize the muriatic acid. Failure to do so will ruin the tank. Neutralization can be done with a garden hose placed in the tank running, to allow a six hour or more purge. Now with a light and a mirror, determine the condition of the tank innards. Fill the tank with water. Plug the two drain bungs. Make a quick gas cap with a fitting of some sort, that will accept a controllable air hose. Pressurize the tank to not more than 1 1/2 lbs. Dry off any water spillage with a blow dryer. Hold the pressure for at least 5 minutes. If any leaks are detected, repair externally as required. Gas welding is the best method. Brazing is the last resort, as sometimes brazing fluxes. Don't allow brass to steel marrying. Brazing may hold for as much as a month or so, but eventually gasoline liquefies the flux between the steel and brass surface, and a leak is inevitable. The same problem occurs with some silver solders, and some lead solders as well. Go over the entire tank with a pneumatic palm sander to remove all the paint. If there's no primer underneath the black or red, or in the rarest of rare cases, blue tank, it will more than likely be the original paint, as the gas tanks were originally dipped without primer in the case of the black tanks. I'm not sure about the red or the rare blue, they might have been spray painted, and could have been primered. If excessive body putty is detected after removal of all paint, a determination is necessary as to whether a portion of the bottom of the tank has to be removed for an access hole, to hammer and dolly back into shape. If the bottom must be opened, use a thin blade metal cutting saber saw. When reaffixing the metal door, first drill a series of 1/8" holes, 1/4" away from the edge of the hole in the tank. usually 4 will suffice. Cut 4 metal tabs from 16 gauge steel sheet, approximately 1" long, 1/2" wide. Use needle nose vise grips to clamp the tabs to the opening. The tab should protrude 1/2". Gas weld the tab in position with a button weld at the 1/8" drilled hole. With the tank upside down, position the door in place. Start the weld of the door by tack welding at the four tab areas. This helps prevent any warping that may occur when final welding is completed. Retest for any weld leaks. It's a good idea to use a modern day tank liner. Make sure the directions are followed, and most importantly, note whether the maker states that the liner is impervious to alcohol. The reason for this is that modern day fuels often contain a small percent of alcohol. Around 10% I believe. Prior to installing tank liner sealant, put a few nuts and bolts in the tank and rattle them over all welded areas to remove weld slag. Clean weld slag thoroughly from gas tank. Next the tank must be fitted to the frame. There are four mounting points, the rear being a Siamized mounting system. There are four rubbers, front tank ears right and left, and two rubbers, upper and lower at the rear. 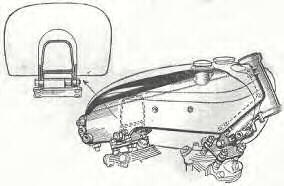 A common problem with Vincent gas tanks is that the foreword ears, and sometimes the gas tank itself, has been squeezed together, decreasing the distance between the two tank mounting ears. In the Vincent motorcycle parts list book, MO19 shows FT80, the front tank rubber, pointing the wrong direction. The larger diameter of the rubber should go inboard against the steering head casting. If the rubber is installed incorrectly, the shouldered bolt puts pressure on the tank, bending the ears. With new rubbers installed properly without the tank, measure with calipers the distance from the large diameter shoulder of the rubber left and right. Measure the fuel tank flanges. The flanges should measure 1/8" less than the rubber shouldered distance. This will allow, when installed, 1/16" crush on either side, allowing proper elasticity of the rubber mounts. Too much crush reduces elasticity. A portapower with a scissor tool can be used to open up the tank ear distance. Now the rear tank rubbers. First check to see that the tank is installed, and front rubbers are tightened to full tube lock of shouldered bolt with washer, and the two tank rear mounting slots are wide enough so that the retaining bolts can be screwed in without touching. A 1/32" clearance here would be a minimum. Install the upper and lower pads. Now with washers, tighten the two retaining bolts where the oil tank flange marries snugly to the bottom rubber pad, and the rubber pad marries snugly to the gas tank flange, and the top rubber marries snugly to the gas tank mounting flange, and the two washers are snug against the upper rubber mount. Turn the bolts two additional turns. This will provide the proper crush, and elasticity will still remain. Of course when the tank is painted (which I'll cover in segment (2) of gas tank restoration) and installed, the two retaining bolts will be safety wired in an X pattern. I have a "standard" Eclipse tank bag which was a hand me down from another Vin owner. It works very well with the standard Vincent tank as far as the mounting straps go and is quite stable but I would recommend a tank cover if you want to protect a nice paint job. Many years and UV light have clouded the clear vinyl cover of the map pocket somewhat on mine but otherwise it has proved pretty robust any I particularly like the side pockets for easy access to stuff. Like a camping tent one has to spray it with a good water repellent from time to time to make sure contents stay dry. Good point about the need to purge the tank during welding. I use a small table outdoors for welding tanks, and back my truck up next to it. A 1-meter length of VW hot-air heater tubing (as used on old beetles to get air from the fan shroud to the heater boxes) connects 1 tailpipe to the filler neck. Petcocks should be removed to give as much flow as possible. Be wary of pressurizing the tank (especially automobile tanks: 1 psi = 144 pounds of push on each square foot of tanks surface, so a little pressure can do a lot of damage.) I also wear a leather welding jacket and a full face shield; it’s hot, but I know I’d be hotter if it flashed. Gettting the gum out: In any event, on Oct 4th, I bought a Shadow basket including its fuel tank a third full of 32 year old high test and adding to the challenge, "indifferently" stored during that time, leaving an extreme example of the "lacquer" gum you referred to along with some superficial rust in the form of a pungent sludge. I too wanted to preserve the exterior finish - not because it was original - but to add to the planned antiqueing of this machine to which now looks like a comfortable well worn but polished English gentleman's boot here. The finish? Nothing spectucular, a Conway's job superbly applied prior to 1959, but lined in gold paint rather than gold leaf. To add to the challenge, 32 years of regular applications of cat urine to this tank had turned the single stage enamel clear coat - a popular top coat finish technique of the time - into a milky vinyl type consistency exposing the fragile lacquer color coat and decals beneath it. As I've done over the years with Indian tanks (soldered not welded) and on my Red Rap tank. I filled it half full with lacquer thinner and a lb of 1 1/4 zinc plated roofing nails sat it on the work bench and then made a daily habit as I passed by on the way to work with the machine on the lift of slowly agitating it then letting it sit. Don't recommend bb's, not enough mass, too smooth and have a tendency to want to stick where any gum remains. Zinc plating on roofing nails is done very thick to act partially in a self-sealing capacity when damaged (hammer blow) and is rather soft. The perimeter edge of the head and the sharp end do their job with less "violence" so to speak than required with other metal based media when agitating by hand. Having less mass than a bolt or nut, they are far less prone to dent your tank. and ending up in the carbs. This did not enhance performance, and created a fire hazard when debris held the float needle open and the carbs overflowed. Large Petrol Tanks: The large tank fitted to Charlie Cannon's bike is not a Montlherry tank as it is the wrong shape. I have been fortunate enough to see an original Montlherry tank some time back, belonging to Pat Highsmith from Northern California. (currently owned by Jim Baltusnik 5/06) These tanks were identical at the front to the standard tank but were raised at the rear by a couple of inches to give a capacity of about 4 1/4 UK gallons. On side profile the top of the tank was almost horizontal. Charlie's tank is a "one off" from an unknown source. Things start to become interesting when you talk about the correct locations for the gold lines and transfers. Series C's are fairly straight forward, if you took the mean average of all the tanks you could measure then you would not be far out with the positioning on the transfers etc. The series B tank was something else. When I first started painting tanks I went to Alan Lancaster's pub where on the wall was an original advertising poster from the factory. It had photographs of both sides of the same Series B and I had brought all I needed to faithfully record the positioning of the gold lines etc. I was wasting my time, this show model had the HRD about 1 inch out, in relation to the opposite side. In truth you cannot see both sides of the tank at the same time and the factory had not expected someone to inspect their poster years later with a slide rule. I have since taken detail measurements from several so called original tanks and yes they are different, the gold lines were applied by hand without the obvious use of a template. Very few people will be able to draw an identical arch to the left and to the right freehand, so don't let anyone tell you the lines on your tank are wrong. A word of warning for anyone about to use Series D Black Shadow transfers from the spares club. They look OK but over the years the water soluble glue has disappeared from the backs and it is only possible use them by painting them with a replacement glue.